Notice top of oak tree? 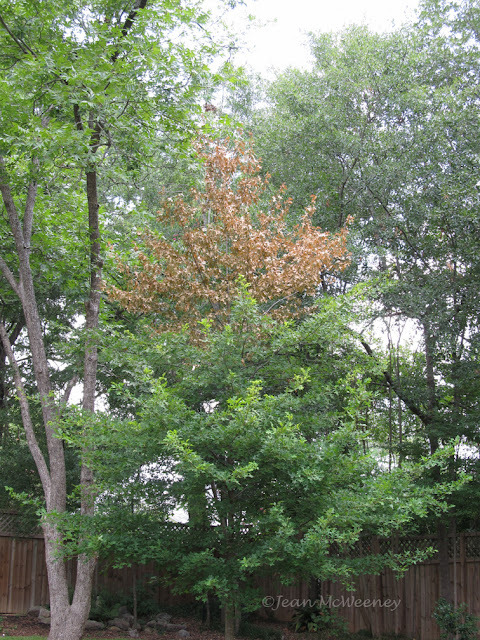 Last month I posted some photos of the awful state of my relatively new oak tree. See my June 5 post for some gory pictures. The diagnosis from the Extension agent was bacterial wet wood, for which there is no cure. He thinks the squirrels may have made things worse and suggested I spray it down with water to remove the "slime." Doing some research on it, I discovered that if the damage is not too extensive, the tree may recover. The oozing stopped and I was hoping for the best. But as you can now see, the top is dead. I'm unsure of what to do. Should I cut that down and hope a new leader grows? Or is it just a matter of time before the rest goes? As depressing as all that is, I'm still on cloud nine from my trip to the Seattle Bloggers Fling. I've got tons of photos to share and so it'll probably take several posts. Stay tuned! I'm not sure Jean. I've never heard of this disease. I hope your tree can overcome it. Can't wait to see your photos from Seattle. I wish I could have attended. I've always thought I would love Seattle. Oh no. So sad. So sorry! Oh, what a bummer, Jean! I wish I knew more about trees and their problems, I'm sorry I'm no help. I have a cherry tree that is in trouble, and I think next year I am just going to take it down. It was nice meeting you and sharing a pizza with you in Seattle. I've never heard of this disease but have seen trees that looked like yours. You could always just cut the top off and see what happens. It might just turn out ok.